Irreversible changes are permanent changes that cannot be undone. Cooking, baking, frying, burning, mixing, rusting, heating are examples of irreversible changes. Irreversible changes are permanent changes that cannot be undone. Give another name for irreversible changes. Why we call them chemical changes? An irreversible change starts with one material and end up with one or more new ones. In an irreversible change, new materials are always formed. The new material is completely different from the original material. Following are some of the irreversible changes examples. Example – You cannot change a cake back into its ingredients. Example – When you heat a raw egg to make a cooked egg, the fried egg cannot be changed back to a raw egg again. Example (1) – When vinegar and bicarbonate of soda are mixed, the mixture changes and lots of bubbles of carbon dioxide are made. These bubbles, and the liquid mixture left behind, cannot be turned back into vinegar and bicarbonate of soda again. Example (2) – If you mix cement powder, sand and water and leave the mixture to stand, it will set hard. 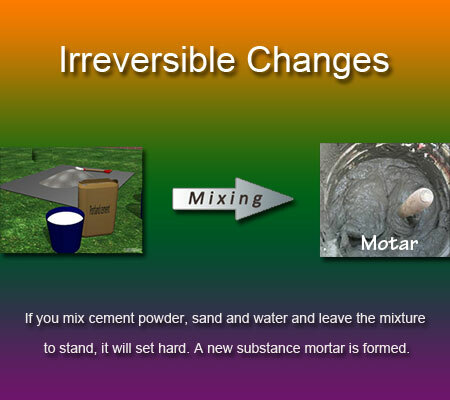 A new substance mortar is formed. Example (3) – If water is added to plaster of Paris powder and the mixture is then allowed to stand, it sets hard. A new substance has been formed. 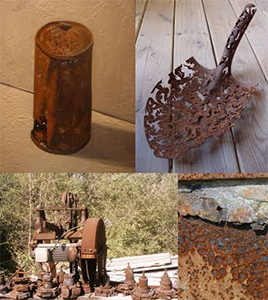 Example – If you leave a piece of iron outside, before long it turns brown and crumbly. This rust is a completely new substance. You cannot easily turn it back into the iron you started with. Example – When you burn a piece of paper, first the paper changes colour then it bursts into flame and gives off a lot of heat and smoke. Soon it ends up as black ash. You cannot change the ash and smoke back to paper. The fungus Yeast is added to moist bread dough and kept in a warm place. The Yeast feeds on the sugar in the bread dough, turning it into carbon dioxide gas and alcohol. The carbon dioxide makes the bread rise. When the bread is baked, the carbon dioxide and alcohol are driven off. There is no way you can turn bread back into the dough it was made out of, and you cannot collect the carbon dioxide and alcohol to make the sugar you started with. Milk is turned into cheese or yoghurt by different kinds of bacteria. We cannot turn cheese or yoghurt back into milk.